click here to peek inside the book! Piecework enthusiasts rejoice! Now great Celtic designs can be created with only two simple blocks. Quilters traditionally use appliqué to create Celtic designs. Instead, Karen has translated knot work into pieced patterns. She found she can create many Celtic designs with two, three, or more blocks, so the possibilities are unlimited. Famous for her use of color and color illusion, the author shows how to use color, texture, and value to add excitement to Celtic quilts. She shares her simple design concepts for those who want to design their own Celtic quilts, while providing piecing tips, pressing options, and quilting ideas. Even beginning quilt makers can tackle these colorful quilt patterns. Teaching tips and lesson plans are included for quilt teachers and shop owners. 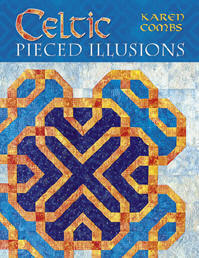 Let Karen show you some illusion tricks and piecing tips from her book, Celtic Pieced Illusions! Click here to view the online video clip. Finally back in print, 3-D Fun with Pandora's Box by Karen Combs and Sharlene Jorgenson! Optical illusions are easy when you know how to do it! With this book, learn how to create 3-D patchwork cubes with a quick strip cutting technique and a simple rotary template. Book includes full color illustrations, fabric selection, rotary cutting instructions, sewing tips, and 5 projects. Projects include a 3-D cube Sampler, Karen Comb's Christmas Cube, Rising Star, Ohio Star and Evening Star. Click here to view online video clip about the book. 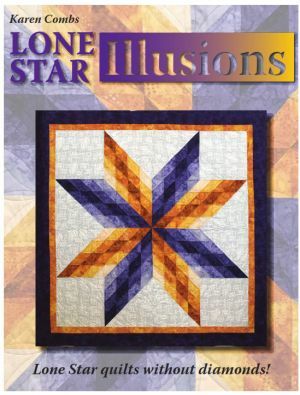 Coming soon - Lone Star Illusions! The Lone Star quilt is something quilters aspire to make. However, many quilters don’t want to tackle diamonds. Karen has created a way to make Lone Star designs with just the simple shapes of squares and triangles. Famous for her use of color and illusion, let Karen show you how easy it is to create Lone Star designs! Booklet contains 3 beautiful quilt designs in two different sizes! For Shop Owners, - for Wholesale Order information of Lone Star Illusions, click here.